Undermining is a game where players need to make the best of the actions available to achieve short term goals, like gaining particular resources, as well as to consider how to set themselves up long term through upgrading their mining vehicle and fulfilling contracts. The game is all about gaining star bucks, with the player who manages to earn the most being the winner in the end. To earn starbucks players will be vying to satisfy contracts for certain resources, but may also earn them for upgrading their vehicles, having resources at game end and finding alien technologies. Upgrading your mining vehicle, or UMVee, is something that will provide the vehicle with permanent special abilities that come in very handy if used wisely throughout the game. Choosing the upgrades that suit the strategy you are pursuing is a vital part of playing the game well. Undermining is a highly interactive game, with players actions sometimes benefiting and sometimes impacting the future actions of others. The competition for resources is, of course, very important. But the use of open tunnel spaces to get where you need to go, and the blocking of such spaces is also key. Players can move through other UMVees, however, doing so costs battery power - and managing your batteries, which allow extra actions, is also an important part of playing well. Undermining comes with a double-sided board, meaning the way players are forced to interact can be significantly different one side to the other. With a random layout of resources, different strategies and bonuses that can be achieved through upgrading your UMVee, the timing of contracts for different resources, and one off special bonuses that can be achieved by finding alien technology, no two games of Undermining are ever the same. Undermining was a game that, when I first heard about it, I was not very interested. It didn’t sound to me like there was much going on, or that meaningful decisions would need to be made. I am pleased to be wrong. 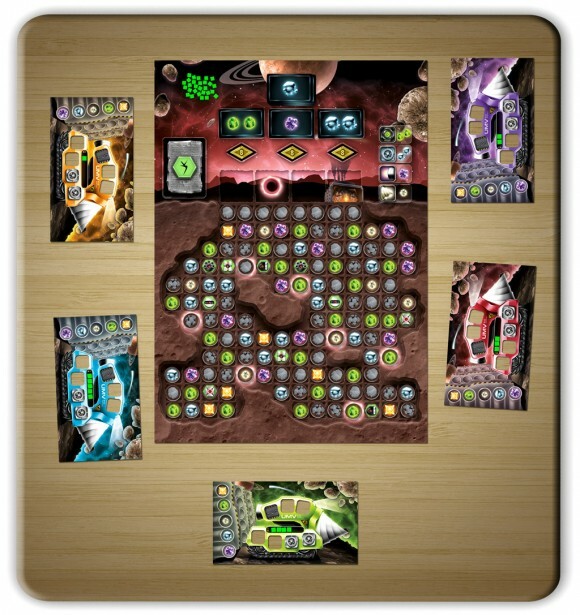 Undermining is not a deep strategy game, but it is fun, and does a great job of filling a 45 minute game slot. You’re mining for precious materials, drilling through worthless rock to gather the resources to upgrade your vehicle, or fulfill contracts for starbucks (victory points). As with most games, gaining the most points wins. Of course, if a game is enjoyable enough, just playing it makes everyone a winner! The first thing you’ll note is the large, darkly colored board, covered with cylindrical tiles. Rock tiles are randomly distributed with colorful resources and alien technology amid the craggy underground. Next, you’ll see the player board, thick cardboard depicting your mining vehicle (UMVee) with multiple slots that will eventually hold upgrades. I especially like the long horizontal slot for battery cubes. As you get more, your batteries are charged, and the visual works great. 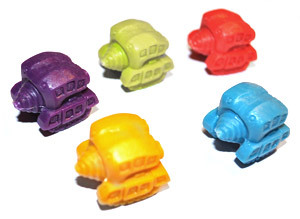 Finally, and certainly not least, the little UMVees, which may be one of my new favorite game pieces. They’re detailed, and fun to move around. Overall (and this is coming from someone that usually doesn’t normally care about components) this game is visually very appealing and incredibly well done. You get three actions on your turn to use wisely. You can spend an action to: drill one space, move two spaces, charge your batteries (gain one cube), or move from one open portal to another. Additionally, if you’re on the single factory space, you can also (for one action) unload goods, build new parts for your UMVee, or fulfill a contract. You may also spend two battery cubes for an action. For the most part, you’re going to be moving your UMVee around, drilling out rock and grabbing resources. These resources can be turned in at the factory and stored, or used to upgrade or gain victory points by fulfilling specific contracts. Which upgrades to get will be important, and are based on the resources you have. Your UMVee can hold up to five upgrades. You can grab a drill bit to increase your drilling ability, rockets to move farther, an extra cargo bay, or a reactor which gives an extra action. Full rocks need two drill power, if you only have one, they’re flipped to the other side, showing rubble that only needs one more drilling. Resources and alien technology only need a single drill action to collect. This game feels like a race to me. You’re trying to get the most out of each turn, and stay ahead of the competition in the upgrade/contract fulfilling game. You cannot occupy the same spot as another player. If you want to move through them, you have to pay two battery cubes (and the movement points) to do so. This allows for some blocking as you make yourself a nuisance to your opponents. There are two different sides to the game board, expanding the variability in setup. The vast number of randomly distributed tiles ensures games will be very different, and allow players to explore different board areas. The best part of the game is deciding when to upgrade (and which upgrade to go after) compared to spending resources to grab victory points through contracts. Contracts fulfilled later are worth fewer points, making the early ones attractive, at the cost of grabbing an upgrade to allow you to be more efficient later in the game. The alien technology cards can be quite strong, but require space on your UMVee to get to the surface. In the end, Undermining is a relatively quick playing, light optimization/race game. It’s more than a filler, but not quite a main attraction game for the evening. It’s easy to learn and play, requiring some decision making without being mentally taxing. I view it as a change of pace game for more avid game players, with the ability to fit into a more casual gaming group. See what Z-Man games (and Matt Tolman) have dug up and try Undermining for yourself! The components of this game are excellent. The colours are vivid, the artwork superb, the UMV Mini’s are just Cute, the player boards well thought out suiting the theme well as well as providing what you need to play. The cards are maybe a tad thin and I did feel the need to sleeve these, as I suspect repeated use may start to tarnish these. The player aids are too small, the writing is in a very small font and is white on a dark background making it hard to read unless you have very good eyesight. Alternative Player Aids, provided by a user Sanders can be found on the internet. This is much better with all the information you need to play the game. Players compete to extract resources from the mine to either upgrade their UMV or complete contracts to earn Star bucks. In order to achieve this on their turn each player has 7 actions they can take using one of the initial 3 Action Points. 2. Drive: Allows you to move your UMV 2 spaces on the board, with each additional Rocket you get to move one more sqaure for each action point spent. So with 1 rocket you would be able to move 3 squares. On the surface UMV’s can move freely and occupy the same squares but underground UMV’s can not occupy the same space nor move through other UMV’s unless the player spends 2 battey tokens but they have to have enough movement to end on a free space. 3. Portal – Allow quick movement around the board, you can only move between “Open” portals, ie no UMV’s or tokens sitting on them. The Portal on the surface is always classed as open. 5. Contracts – Whilst at the Refinery on the surface a player may spend resources from their warehouse to complete a contract (1 per action point spent), taking the top star buck from the pile underneath as payment. (These reduce in value on each stack). 6. Build – Whilst at the Refinery on the surface a player may buy and attach upgrades for your UMV. Container – which adds an additional storage to your UMV. Drill Bit – Increases your drilling by 1 for each Action Point spent. Rockets – Increases your move by 1 square for each Action point spent. Reactor – Increases you total action points by one. 7. Unload – Whilst at the Refinery on the surface a player may unload their containers into their Warehouse, unlimited resources can be stored in the warehouse. If you managed to drill an Alien Tech token when you take the unload action you take a card from the deck. You can use this alien tech at any point on your turn and they give you various bonuses to aid your mining efforts. These include extra drilling, extra movement, unload anywhere, teleport and extra battery charge all of which enhance you ability to plunder the resources on the mine. The game turns play very quickly and there is a lot of competitive play available here as everyone attempts to get to all the good “stuff”. You can go for early wins buy completing contracts for the higher payouts or go for upgrades early to enable you to dig more, deeper and faster. You count up all your star bucks, you get 1 for each resource you have left in your warehouse/cargo and you also get a sliding scale of points awarded for how many upgrades you managed to build and you also get 1 point for each unused alien tech card. This game is just pure fun, it plays very quickly and is easy to teach. I have played this with 2 & 3 players and everything works really well with these numbers. Obviously the more players you get the better this game will be as there will be more competition for everything. In all the games I played the scoring was close, even between people who upgraded a lot vs people who just went for contacts early. This is a well balanced game, which is quick to setup and play with lots of fun. I enjoyed this game and it already has seen a lot of play and I can see this being a popular game with my group. In Undermining each player steer a UMV, trying to gather elements to forfil contracts in order to gain points. The game is action based, each player have a basis of three actions per turn. There are a number of ways to get more actions to get ahead of the other players. Of course an action is to move and drill with the UMV, but also it is possible to move elements from the UMVee to the storage area, satisfy a contract, buy an upgrade or charge the battery. The components of the game are high quality, both the game board, the tokens and the player boards are very nice. Once the board have been set the game is very straight forward. Actually, once we used the set-up page, we went forward without the rulebook since it is so intuitive. This asspect both make the game easy to learn but also makes it less apeelling to experienced players. Add a Review for "Undermining"